Burgundy style beef stew. Try this well know French classic. 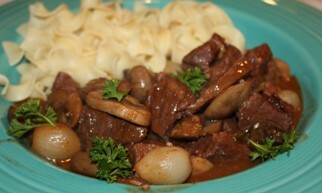 Beef Bourguignon calls for inexpensive cuts of beef so it is relatively cheap to make. Parboil and peel the pearl onions. (If you cut the bottom end off the parboiled onion and gently squeeze the onion with pop right out of the skin) set onions aside. In a dutch oven cook the bacon over medium heat until golden brown. Remove the bacon with a slotted spoon. Set the bacon aside. Increase heat to medium-high. Add the beef 1/3 at a time and brown in the bacon grease. (If you add all the beef at once it will not brown well) Set meat aside. After all the meat is brown drain off the remaining grease. In a seperate pan add 2 Tablespoons of butter. Add the pearl onions and mushroom, stirring frequently, brown until golden. Set aside. In the dutch oven that you browned your beef in, saute the garlic and onion until soft. Add the flour and stir until well mixed. Add wine, tomato paste, bouquet garni and beef broth. Bring to a boil. Add beef and bacon to the broth mixture. Reduce Heat and simmer for 3 hours. Add in the mushroom and pearl onion mixture. Cook for 30 minutes. To make a bouquet garni tie fresh parsley, thyme, oregano and a bay leaf in a piece of cheese cloth. You can also put the herbs in a tea infuser.